I’ve long been a fan of Maggie’s Organics, and I lived in their tights when I was pregnant. Now Maggie’s is venturing into stuffed animals. Like their sock monkey, Maggie’s Organics Penguin is made from excess fabric and slight irregulars, including the hat made from tie dyed socks! Unlike Mattel, that claimed Barbie was going green by making accessories from fabric scraps, I trust Maggie’s because they have always been a Fair Trade and organic company. DESCRIPTION: The second stuffed animal in the Maggie’s Menagerie collection has come to life! 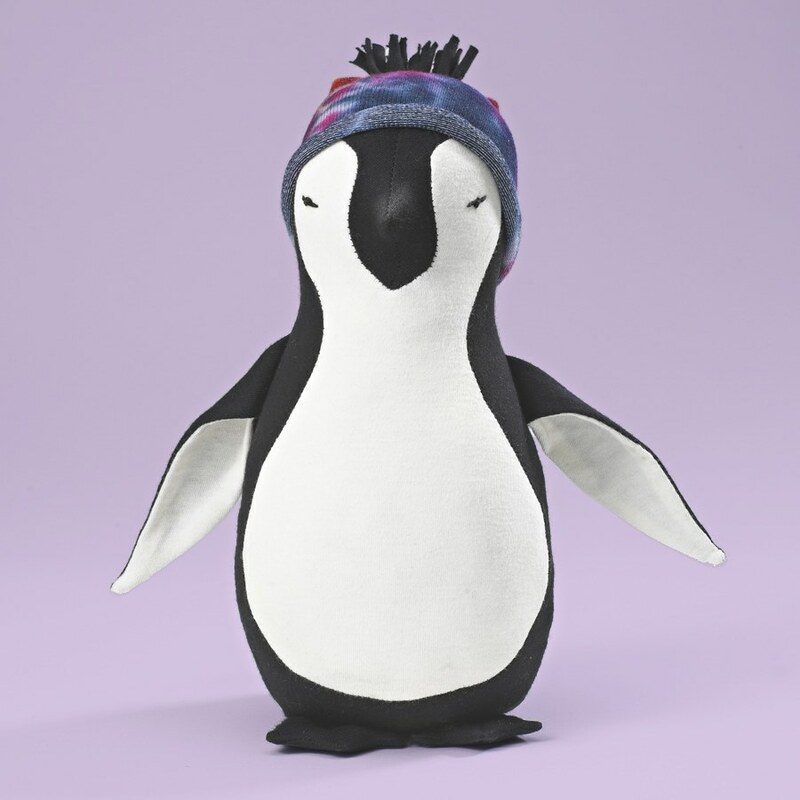 Typically Penguins don classic black and white attire… but our Penguin has taken a walk on the wild side, sporting a colorful stocking cap made from our incredibly popular tie dye socks and legwarmers. The animals are made from excess fabric and irregulars and stuffed with reclaimed polyester mill scrap. The Penguin’s embroidered eyes and securely sewn on hat make it safe for all ages. Maggie’s adorable penguin is not made in China. Made in the USA at 100% worker-owned cooperative Opportunity Threads in Morgantown, North Carolina, these stuffed animals bring apparel jobs back to the US. Ever since 1999, when Maggie’s President, Bená Burda helped a group of hurricane victims form a worker-owned sewing cooperative in Nicaragua (Maquiladora Mujeres), she had hoped to one day bring the idea home, where so many US apparel workers have lost their livelihood. Last summer, while presenting at a workshop in Asheville, Bená met the folks from the SACCO (Southern Appalachian Center for Cooperative Ownership/ Ownership Appalachia), and they agreed to help her turn Maggie’s dream of a domestic sewing cooperative into a reality. Maggie’s is a company I wholeheartedly trust and adore. « Do You Need a UV Pocket Purifier? That is so cute. I love penguins. My little guy still loves his Maggies Organics sock monkey. He even stole his sister’s so now he sometimes carries around both of them and sleeps with both of them. I bet my daughter would love the penguin even better than the sock monkey.